The Coalition Government has announced it will bring the Aussie Farms website under the Privacy Act, exposing it to potential penalties of more than $400,000 if it breaches the Act. The crackdown comes as Queensland Police confirm that two alleged ringleaders who organised an invasion of a Millmerran feedlot by about 100 or more activists last month (pictured right) have been charged. Major and Organised Crime Squad (Rural) allege a 29-year-old woman and 26-year-old man, both of Margate were the principal organisers of the trespass incident and were charged today with unlawfully entering farming land. They have been bailed to appear in the Toowoomba Magistrates Court on May 9. Investigations remain ongoing with further arrests anticipated, the QPS said. “The company publishes information about Australian farmers and agricultural producers including their names and addresses, exposing them to potential trespass, biosecurity hazards, and reputational damage,” Mr Porter said. 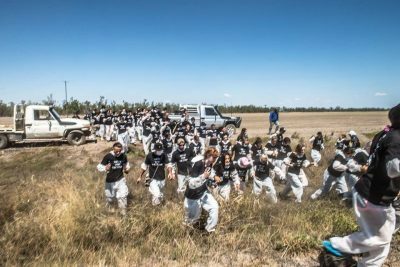 Social media posts suggest the Aussie Farms group is rallying supporters to engage in protest events at several locations around Australia this coming Monday, April 8, to coincide with the 12 month anniversary of the release of the vegan documentary Dominion. Mr Littleproud said the Australian Information and Privacy Commissioner previously found that Aussie Farms Incorporated was exempt from the Privacy Act because its annual turnover was less than $3 million. Prescribing Aussie Farms Incorporated allowed the Information and Privacy Commissioner to investigate, either in response to a complaint or on her own initiative, if Aussie Farms Incorporated breaches the Privacy Act. The prescription comes into force as of tomorrow, Saturday April 6. The Australian Meat Industry Council chief executive Patrick Hutchinson said AMIC welcomed the announcement that the ‘shameful’ Aussie Farms website would be brought under the Privacy Act. “Aussie Farms could now face penalties up to and over $400,000 for breaches of the Act. This is an important step in protecting the rights of our members and all in our supply chain. Activist encroachment onto our members’ sites hurts hundreds and in some cases thousands of employees and their families who are working to ensure a safe and consistent food supply for Australia and the rest of the world,” Mr Hutchinson said. Meanwhile, Meat & Livestock Australia, in partnership with the red meat industry and National Farmers Federation, is continuing to provide information and advice to red meat producers in the face of increasingly confrontational activity by animal rights activists. This includes background information about the Aussie Farms website which lists details of thousands of Australian farms, what actions producers should consider taking now and what to do if they encounter trespassers on their property. NFF and the red meat industry is deeply concerned that personal details of individual properties are featured on the site – given that many of these farms are also family homes. Trespassing on farms or entry without prior permission presents a substantial biosecurity risk that could be detrimental to the health and well-being of livestock. It also presents a safety risk for farming families and their employees. Is your property on the farm map? Check the map by visiting aussiefarms.org.au. Ensure the safety of your family, farm workers and livestock. Take immediate action to inform everyone on the property of the intrusion. When able, compile a written record of what happened and update your Biosecurity records. Many of the farms currently being targeted by activists are run by families, not faceless corporations, as activist groups like Aussie Farms try to get people to believe, said AgForce Cattle President Will Wilson. Mr Wilson said he respected animal groups’ right to protest, but that they had no right to break the law and threaten farmers and their families in order to express their opinion. “We’re talking about farmers – hard-working Australians who just want to be allowed to go about their absolutely ethical and legal business, it’s that simple. “Peaceful protest is one thing, but trespassing onto someone else’s property, frightening children and animals, breaching biosecurity measures that are there to protect everyone – this is illegal activity. “The activists are signalling that to get their message across they’re prepared to do whatever it takes. Even if that means operating outside the law. “But whatever happens, whatever measures the activists take, we’re telling our members and anyone who is subjected to attack, to remain calm, to let the Queensland Police Service handle it. Mr Wilson said it was an individual’s personal choice whether they decided to eat meat or other animal products, or they didn’t, but that no one had the right to forcibly and illegally push that view onto others. “And no one has the right to affect someone else’s livelihood or personal safety either,” Mr Wilson said. “There is a genuine feeling of fear among the producers I’ve spoken to. It’s spreading. No one knows where these activists are going to turn up next. “Australian farmers have the highest standards of animal health and welfare in the world and we would be proud to show any genuine visitors around our property. But the activists carrying out their intimidatory tactics weren’t invited. I’m not aware of anyone asking if they can come on to a farm to look around. “The announcement by Minister Littleproud and the Federal Government today, which will bring the Aussie Farms website under the Privacy Act, is therefore welcomed. “We’d also like to see the Queensland Government give stronger powers to the Queensland Police to do more to actually penalise the people doing the trespassing by beefing up and enforcing trespass laws.